Technical writing is a lot like business writing. The two styles of writing overlap so much that any business writer can employ tech writing tactics to their work, and vice versa. Ultimately, both focus on the audience and what they will need to get out of the document. And when it comes to writing jobs, you serve as the medium between the expert and audience. These authorities in their field of knowledge, also known as subject matter experts (SMEs) could include engineers, project managers, technicians, or simply any colleague who’s experienced in the topic. Your mission as a technical/business writer is to take the language of the SME and fashion it into a form that can be digested by your audience. In order to translate the information, you must first collect it from the expert: a process that often involves educating yourself and interviewing the expert(s). If you have the opportunity, it is always a good idea to integrate yourself into the project or research at hand. Reading existing documentation on the topic and attending meetings will give you a strong head start to developing your work. Additionally, making yourself a member of the team gives you a better grasp of the time frame and most important aspects of the project. A defined schedule with milestones will help manage time for each task and account for any inevitable setbacks or delays. Once you’re familiarized with the task, you can commence the interview process, which likely will last the duration of the project. Interviews should be personalized for the goal of the interview and convenience of the expert. They’re often iterative throughout the entire process and can include one-on-one physical interviews, email questionnaires, phone conversations, or even surveys, if you’re trying to reach many experts. It’s important to form a game plan for your information gathering so you can lay out a set of expectations for the interviewees. What is the audience? What prior experience/education do you expect from the target readers? 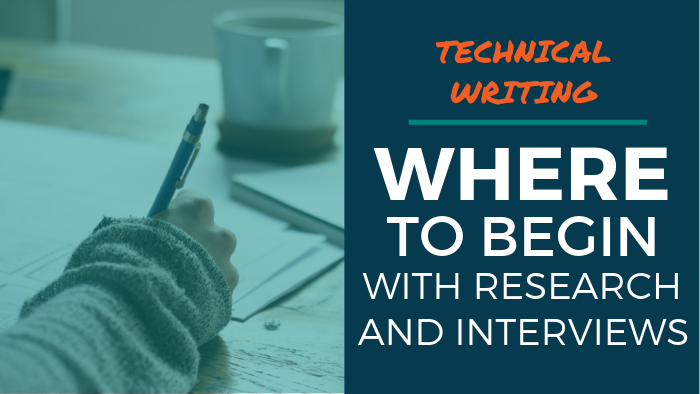 What sort of background knowledge is required for you, the technical writer? Are there any secondary resources that the expert thinks would be a good place for other data? What is the underlying purpose of the document? Is the goal primarily to educate the readers or are you simply consolidating the information in a more-digestible form? How should the information be constructed (i.e. what medium and style)? Will the documentation span multiple forms of media? Will the form change for different audiences? Are there already templates or standards for this type of work in the company? Once you have these details confirmed, you can perform the bulk of the interview process: collecting expert information about the project. Being an active listener here is key, as the expert may not communicate in a very organized manner – the reason they need a technical writer in the first place! Utilize different tactics to get the expert passionate about the subject so the interview process isn’t a burden, perhaps learning a bit about the interviewees and their personal stake in the project. Making the expert realize that you are part of the team and you’re both working toward the same goal will considerably smooth out any interaction. Ask the expert to walk you through their interpretation of the project or system and note the aspects that he or she considers the cornerstones. Take good notes throughout the interview and record the conversation, if possible. Finally, ask your questions. This is a good opportunity to place yourself in the shoes of the audience.